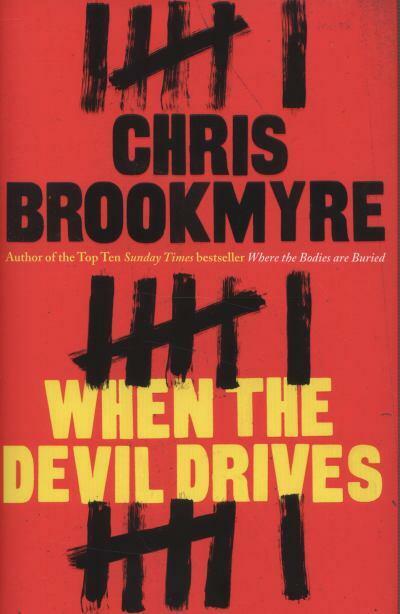 Christopher Brookmyre is a writer that I’ve heard on the radio many times and comes highly recommended but I’d yet to read any of his books. My choice of When the Devil Drives was a result of using for the first time ( I think) Amazon’s rating system to choose a book. I deliberately don’t use ratings on my reviews mainly because, if my Goodreads account is anything to go by, most of my reading would be either 3 or 4 stars. However I scoured the Amazon ratings for Brookmyre’s body of works and chose the one with an aggregate of over 4 stars. As it turned out this was a mixed blessing as a bit of simple further research would have revealed that this was the second book in a series. But nevertheless it was a very enjoyable read although I was kicking myself that I didn’t start with the first book Where the Bodies are Buried. Private investigator Jasmine Sharpe is hired to find Tessa Garion, an aspiring actress who hasn’t been seen since the early 1980s. Her seriously ill sister wants to trace Tessa and Jasmine soon discovers that the absence of tax records since her disappearance means that Tessa is either ‘very rich or very dead’, and suspects the latter. Tessa’s last tax return is related to a brief stint with the Glass Shoe Company, a theatre group where many of the participants have subsequently become famous figures in the entertainment industry. Meanwhile, Detective Superintendent Catherine MacLeod is called to a shooting in a remote Scottish castle. A theatre performance for corporate clients has ended in the shooting of one the principal guests. It’s been a while since I read a book set in the UK with a private investigator as its main character and I’d forgotten how much I enjoyed PI mysteries. Jasmine Sharpe reminded me a little of PD James’s Cordelia Gray but this could well have been because I entered the story in book two where she is taking over the business from her dead employer, her Uncle Jim. The opening chapters gave a new reader like me plenty of background information about how she had arrived at ownership of the business and her work seemed a realistic mix of the mundane set amongst the more glamorous hunt for Tessa Garrion. When Jasmine herself comes under threat she calls up her protector Fallon who still refuses to reveal his precise relationship to Jasmine’s dead mother. Fallon as a character was a satisfying mix of deadly intent and loyalty to Jasmine. The police investigation of Catherine Macleod was slightly less interesting, mainly I think as the relevance to Jasmine’s investigation wasn’t revealed until late in the book. However the sections involving Catherine did have interesting exchanges with her more relaxed husband on the relationship between explicit video games and violence in the wider society, passages that worked well in contrast to the deaths in the narrative. There were plenty of twists and turns in the plot to make the resolution of the mystery of Tessa’s disappearance different from other missing persons investigations. If the quality of this book is anything to go by I’m certainly going to read more of Brookmyre’s novels. Sarah – Thanks as ever for an excellent review. I too must catch up on this series as I’ve only a nodding acquaintance with Brookmyre’s work. This one sounds like a very solid PI series. I’d be interested (as always!) to hear what you think Margot. This sounds like good fun – I’ve read a couple of Brookmyre’s before but none from this series and not in any particular order. They have all been very enjoyable. This has made me want to pick out another of his from my to-be-read stash some time soon! Thanks Marie. Those whom I spoke to who had read Brookmyre’s novels all seemed to like them. I enjoyed his style of writing which was of a high quality.